On this trip it's birds, deer, hairy cows... oh, and a small shark! I enjoyed another visit to the Bristol Channel recently, and as always I was hoping to land something new. Skipper Dave Roberts knows I’m still a relative newcomer to sea fishing so keeps in mind what species I haven’t caught, and this trip was no different as after an overnight stay he suggests I get to the boat an hour or so before we’re due to depart. Not that I minded as while I’m sorting my gear from the car I’m joined by fishing pal Martyn and we eventually stroll down and board our waiting charter Alykat II. I’d driven up the previous day and had an excellent afternoon exploring the nearby Exmoor National Park with Martyn as my guide. Getting good views of many of the parks residents, from the Exmoor ponies, to their iconic red deer, and some of the hairiest cattle I’ve ever seen, all armed with serious sets of horns, even though Martyn tells me they’re relatively placid… yeah right, after you then mate? There was also plenty of bird life flitting amongst the grasses and sedges, so when a Redstart posed beautifully on a branch surrounded by the yellow flowering gorse bushes it was the perfect picture, only Martyn hadn’t quite got his camera out when it hopped off never to show itself again! But back to the boat, and Dave soon has me pulling up a small rope hanging over the side which I soon find is attached to a net, and as I bring it aboard I see there’s half a mackerel and three or four small crabs inside. So that’s it, we’re catching bait for the trip. Forty five minutes gone and we’ve caught enough of the little nipping devils, and not long after the rest of the lads start turning up and then we’re soon on our way. There’s a reasonable breeze blowing so we head along the coast and plot up fairly close in. Dave shows me the best way to pop a crab on the hook, then it’s over the side and wait. The proverbial dogfish start arriving to some of the lads using mackerel or squid baits but my rod remains still. Then after half an hour I get a knock, and another, I then begin reeling in and realise I’m suddenly connected to a torpedo that soon starts taking back more line, it’s a great fight but I finally get it to the surface as Dave scoops it up in the net. Another smoothie, but not as big as mine Phil! Yes, it’s a new species for me, a little shark! Well actually it’s a smoothound, a starry smoothound to be exact, with the telltale white spots along its back. So I’m pleased as punch, and the rest of the guys are happy as they think we’re in for a few fish now. But in the next hour only ‘doggies’ make an appearance, well to most of us except Neil, who’s doing his best to catch absolutely nothing! 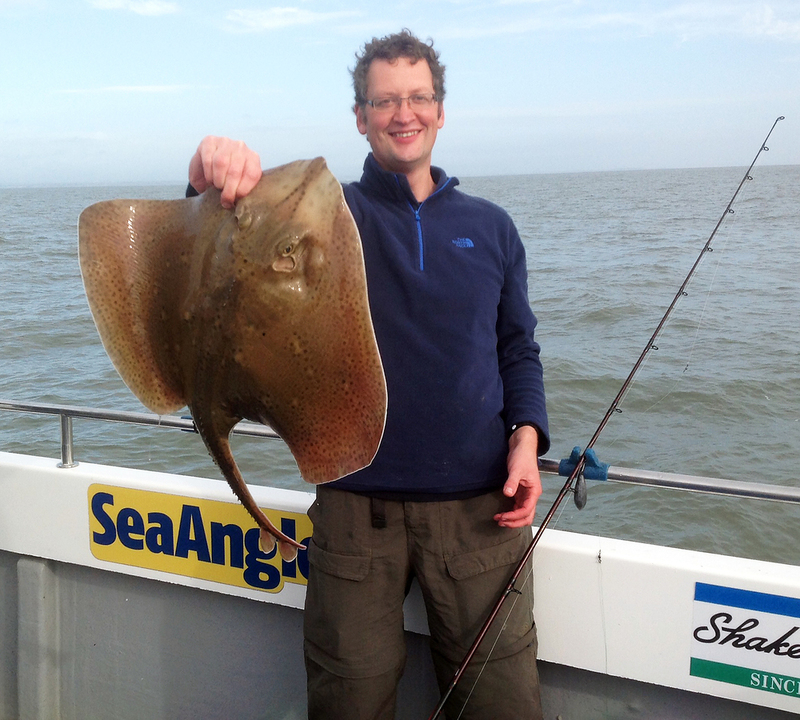 We move back along the coast and catches start to improve, with Neil (another one!) 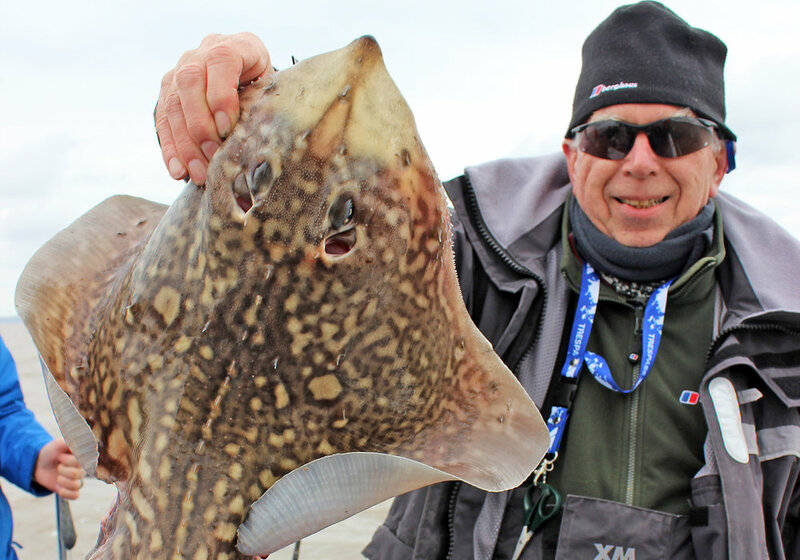 pulls in a nice bull huss, and not long after Phil bags our second smoothound of the day. In the mean time I seem to be stuck catching doggies, but at least I’m catching, as Neil still hasn’t hooked a thing, oh dear! Another move, and this time we head for deeper water. 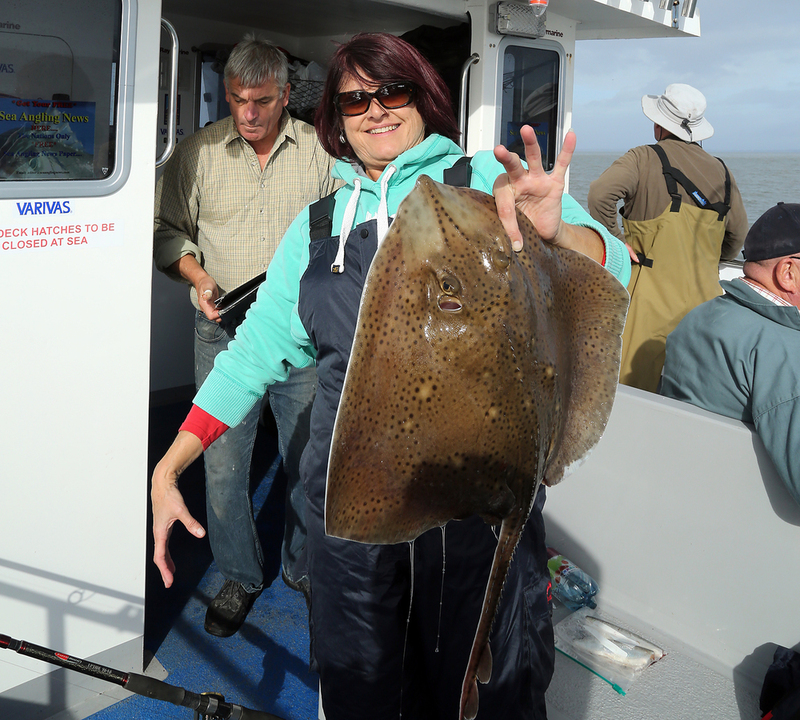 It seems to work as fish start biting, Martyn brings in a thornback ray, and PJ soon has a bend in his rod… oh no, he’s hooked the anchor chain! Then the unthinkable happens, Neil gets a bite. Yes he’s now playing something in the depths, and it looks like it could be a good fish. When he finally brings it in he has a cracking small eyed ray which is big enough to be weighed and goes around 11-12lbs, a true specimen. Well the wait was worth it then Neil! More ‘thornies’ from PJ, Chris and Phil, and two or three congers from the other lads make it a reasonable day’s fishing. With a friendly contest run by Dave for the most caught and number of species it all adds up to a great outing. Think I’ll have to come back. Lift, then wind, and lift, then wind... plenty of action in my Ugly Stik... that's my rod by the way? My trip to the Azores gave me more than just an insight into big game fishing, it also left me with a feeling that I should be getting out on a boat more often and enjoying a bit of sea fishing. It's an area of the sport I've sadly neglected and besides a bit of mackerel spinning off the back of some friends of my parents boat many years ago, and a few outings fishing off the end of Southend pier (which was actually good fun catching bass on my carp rod! ), I've not spent much time on the sea at all. So on this recent foray into the middle of the Atlantic I'd joined up with a group of Canadian, American and British journalists, and we spent most of the touring days together having a great laugh whilst taking in the sights, and amongst this group were a lovely couple, Martyn and Lucy who come from out Bristol way, and it always seemed that we'd be the last ones up, having a nightcap or two in the hotel bar... but that's another story! Before leaving we'd swapped contact details and once home were soon pinging each other copies of photo's that would help both of us finish our write ups of the trip. It was during one of these exchanges that Martyn mentioned that if at any time I fancied getting out on a boat to let him know as they had regular outings, and he could ring me if a place became available, to which I quickly replied yes I was up for that. 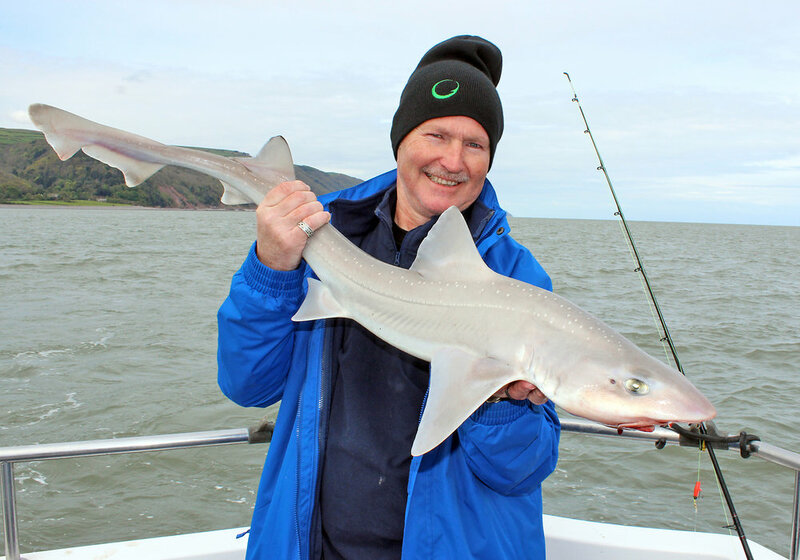 I think it was only a week later when Martyn emailed to say that their next outing had a couple of spare spaces, and so all of a sudden I was booked in for my first charter trip in the Bristol Channel. Having to use the M25, M4, and M5, and finishing with a small twisting 'A' road to make my way over to Minehead, where our charter was moored, didn't make for a brilliant journey, such is our over congested road system nowadays... but once I arrived it was fine, the pub Martyn had recommended for my overnight stay was great, easy parking, clean rooms, good selection of food and beer... the latter of those being most appreciated after the long drive! Martyn, Lucy, and our skipper Dave Roberts were already there, discussing dates for their future trips, and we all ended up having a bite to eat together, which was great as I could have a word with Dave about one of his other sidelines, the Sea Angling News, a free national newspaper that he runs. Containing articles and catch reports, as well as being a general source of information for sea anglers, it has an estimated readership of 45,000 and is available from a host of outlets around the country. The brews were slipping down so nicely but we didn't leave it too late, not wanting to spoil tomorrow's fun, saying that we didn't have an incredibly early start and once up and showered the following morning I had time for a full english at around 8am before grabbing my waterproofs and walking all of 50yds round the other side of the pub to meet up with my friends again and get introduced to the rest of the party of Neal, Chris, Alan and Mike. The banter started almost immediately and I knew we were going to have a good laugh today let alone what we might catch, so once everyone was suited up and had their gear sorted it was a two minute walk to the harbour, and the steps down to our waiting charter the Alykat Too. Helped aboard and greeted by skipper Dave we soon had the tackle stowed away and then the engines were throttled up as we made our way leisurely past the harbour entrance. It was a great paradox really as I went to the 'exotic' Azores and expected to be sipping a cool beer or two on the back of a smooth sailing boat in calm, cobalt blue seas, and instead I got 10-12 foot high waves pounding the boat each day, and then thinking this time I'd get the usual British weather of wind, rain, and grey rolling seas, and I end up with blue skies, flat water, and warm enough to lose the jacket! Mad, or what? We initially cruised out to a sandbank not far from the harbour with Dave hoping we'd get into a few rays, which are the mainstay of the fishing here. The rest of the party started setting up their gear and then Dave brought out rods for myself and another lad Mike as we didn't have our own. I was going to use the latest Shakespeare Ugly Stik GX2 12-20lb boat rod with a Penn Fathom 15 multiplier reel. This was loaded with Spiderwire Stealth Code Red braid with a 22kg breaking strain. On the business end was a 10oz bomb running ledger mounted on a metre of 80lb trace to a single size 5/0 hook. For bait we were using a cocktail of mackerel and squid, sliced up and threaded onto the hook. I think later in the day some of the guys were mixing it up and trying herring and sandeels as well. After only five or ten minutes one of the group had a fish, a dogfish, which to me was great, but it seemed they were relatively easy to catch and were basically regarded as a pest! It was unhooked and unceremoniously thrown back. With half an hour gone most of the party had caught a dogfish or two, not that anything had bothered my bait yet, but the skipper now decided that as no rays had turned up it was time to move and we then headed out North of the harbour for about 3 miles to where the seabed was made up of mud, sand, and coral which is perfect for crabs and prawns which in turn attracts many other fish that then feed on them. And it turned out to be a wise move as within minutes of anchoring up our first ray made an appearance... and even I was starting get some action pulling in my first dogfish! Like any fishing there are times when you catch, and times when you don't, days when you land plenty and others when it's down to the one fish, and so it was on this trip. As it seemed one side of the boat would have all the fish one minute, and then the other side would produce a larger fish out of the blue and vice versa. But with myself and the other relative 'newbie' Mike at the back of the boat where we would 'downtide' from, which basically means all we had to do was lower our leads over the water then put the reels into freespool allowing the lead to drop until we felt it hit bottom, then give a little bit of slack, and await the next bite, and we certainly had a few. With plenty of rays brought aboard during the session I think we all had at least one each and some had many more, it was left to Martyn, Lucy and Mike to catch the congers from the port side of the boat, then Chris and myself in the opposite corner pulled in the bull huss, with Chris getting a couple and me landing one. I was lucky in that this being my first sea outing all the fish were new species to me, and all new personal bests too I suppose, just loved catching that bull huss right at the end, great looking fish! So my thanks to skipper Dave for putting us right on the fish, and to Martyn and Lucy for inviting me along, plus the great company from the rest of the party, and I'm sure I won't be able to stay away for long so see you all soon I hope.